So far, we have mostly been looking at compounds that contain one chiral center -- that is, one tetrahedral carbon atom with four different groups attached to it. Could there be more than one chiral center? Of course. For example, if carbohydrates have an OH group on every carbon in a chain, we might get a number of chiral centers in one molecule. Thinking in Fischer projections, that means each of the OH groups on the chiral centers could be drawn either on the right or on the left. Of course, two compounds with multiple chiral centers could still be enantiomers. Maybe we have two carbohydrates, one with all of the OH groups on the right in the Fischer projection, the other with all of them on the left. Those two compounds would still be the exact opposite of each other. They would still be enantiomers. Suppose instead that only some of the chiral centers were opposite, and others were the same. The compounds would no longer be exact mirror images of each other. The mirror would be flawed. These isomers would be called diastereomers. We know that enantiomers have the same physical properties. Diastereomers do not. For example, they have different melting points, because the two isomers cannot pack together in exactly the same way, and the intermolecular attractions are different in each case. Diastereomers only occur in compounds containing more than one chiral center. In a pair of diastereomers, some of the chiral centers are the same in the two molecules, but others are different. Diastereomers are stereoisomers that are not mirror images of each other. Threose is an example of a biological molecule (a carbohydrate) that contains two chiral centers. Figure SC9.1. Pictures of D-threose. Figure SC9.2. A ball-and-stick model of D-threose. Fischer projections are sometimes used in showing carbohydrates and other chain compounds with many chiral centers. Fischer projections are Picasso-esque drawings in which the point of view alternates from one carbon to the next. The chiral centers are easy to compare in Fischer projections because you simply have to decide whether groups are on the same side or opposite sides of the vertical line. Figure SC9.3. A little more insight into D-threose. D-threose is chiral and it does have an enantiomer. Its enantiomer is called L-threose. L-threose has exactly the same physical properties as D-threose, except for one. A solution of D-threose rotates a beam of plane-polarized light to the right, whereas a solution of L-threose rotates the plane to the left. Figure SC9.4. A ball-and-stick model of L-threose. However, D-threose also has other stereoisomers that are NOT its mirror image. These isomers are called diastereomers. These compounds have different physical properties from threose, so they have a completely different common name. That's because common names for compounds were often coined before anyone knew about the structure of the compound. Figure SC9.5. A ball-and-stick model of D-erythrose. Figure SC9.6. A ball-and-stick model of L-erythrose. The relationships between D-threose and its stereoisomers can be seen in wedge-dash projections. The family of aldobutanoses -- that is, four-carbon dugars containing an aldehyde group -- is presented together below. Figure SC9.3. The relationship between D-threose and its enantiomer, L-threose; also, the relationship between D-threose and its two diastereomers, D- and L-erythrose. Alternatively, these relationships can be viewed in Fischer projections. Figure SC9.3. The relationship between D-threose and its enantiomer, L-threose; also, the relationship between D-threose and its two diastereomers, D- and L-erythrose. Once more with Fischer. In a pair of diastereomers, some chiral centers are the same and some are opposite. The molecule is neither identical to nor the mirror image of its diastereomer. D-threose is the enantiomer of L-threose. The two are non-identical, but they are mirror images of each other. It may help to look at three-dimensional models of these sugars. Go to Animation SC9.1. 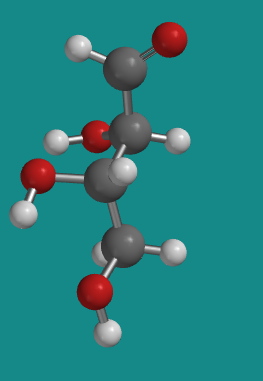 A three-dimensional model of D-threose. Go to Animation SC9.2. A three-dimensional model of L-threosee. Go to Animation SC9.3. 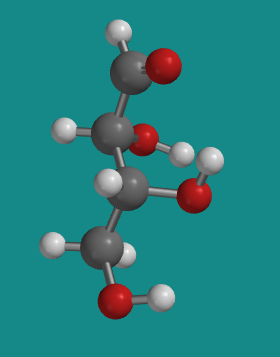 A three-dimensional model of D-erythrose. Go to Animation SC9.4. 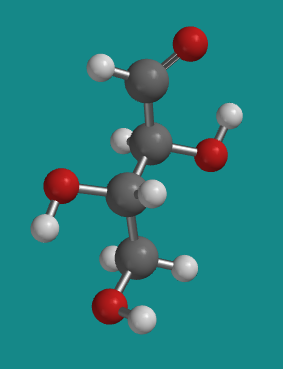 A three-dimensional model of L-erythrose. Take a look at the three-dimensional model of D-threose using the stick model. a) If you turn it so that the carbonyl is at the top and the OH and H of the first chiral carbon are coming towards you, is the first OH on the right or on the left? b) If you turn it so that the carbonyl is at the top and the OH and H of the second chiral carbon are coming towards you, is the first OH on the right or on the left? Take a look at the three-dimensional model of L-threose using the stick model. 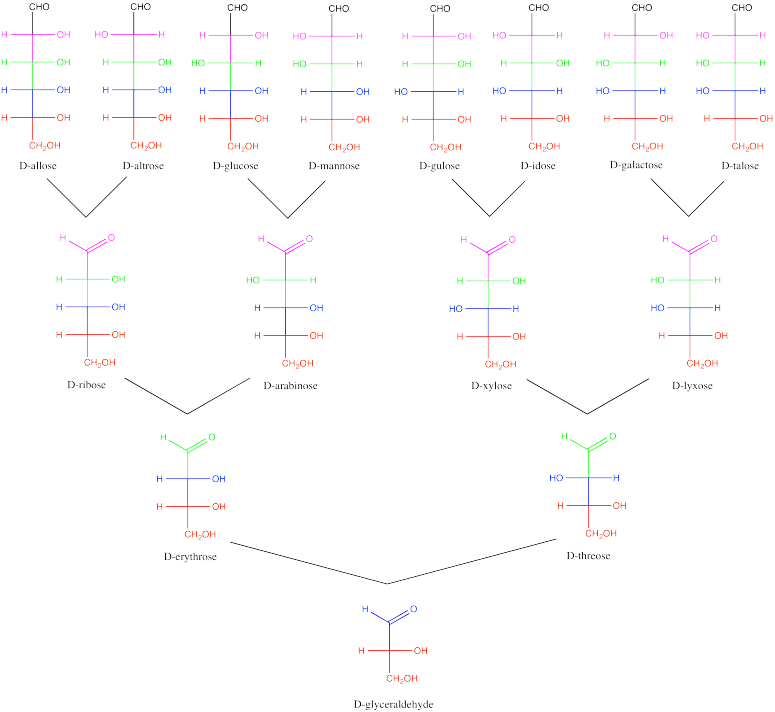 Take a look at the three-dimensional model of D-erythrose using the stick model. Take a look at the three-dimensional model of L-erythrose using the stick model. When there is one chiral center present, two stereoisomers result. When there are two chiral centers present, four stereoisomers result. For each additional chiral center, the number of stereoisomers doubles. Carbohydrates can be classified according to their stereochemistry, forming a sort of carbohydrate family tree. They are considered to originate from the simplest carbohydrate, glyceraldehyde. Addition of a new carbon to the C=O unit of glyceraldehyde produces two possible isomers, because a new steresocentre is formed. From there, additional carbohydrates can be built up, one carbon at a time. 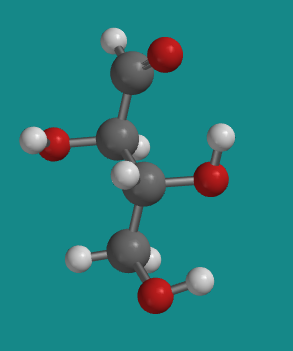 In the carbohydrate family tree, glyceraldehyde is great-grandmother. Figure SC9.4. Relationships among a family of D-carbohydrates. What are the absolute configurations in L-threose? What do you notice about the relationship between the configurations in D- and L- threose? What are the absolute configurations in L-erythrose? What do you notice about the relationships between the configurations in L-erythrose and L- threose? Suppose a compound contained three chiral centers. a) How many possible stereoisomers would there be? b) How many different pairs of enantiomers would there be? c) Suppose you selected a pair of diastereomers from this group. How many possible pairs could you choose from? Draw one enantiomer and one diastereomer for each of the following compounds.